Post-race updates from the SX1 and SX2 classes at the 2018 AUS-X Open Sydney, direct from Qudos Bank Arena in Sydney Olympic Park. 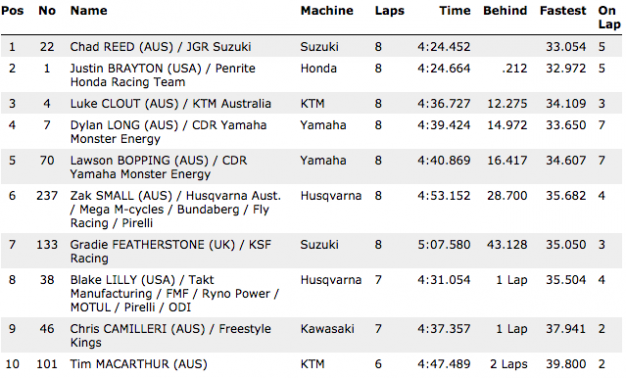 DPH Motorsport’s Dylan Wills snagged the first hole-shot of the night as championship leader Jay Wilson (Yamalube Yamaha Racing) was relegated down the field in an aggressive opening turn. Jy Roberts (Husqvarna) shifted to P1 followed by Jacob Hayes (Serco Yamaha), the duo maintaining positions two and three, as Wills, Aaron Tanti (Complete Parts Kawasaki Racing) and Kaleb Barham (Husqvarna) completed the first five. Wilson wound up in and will have transfer to the main via the LCQ. 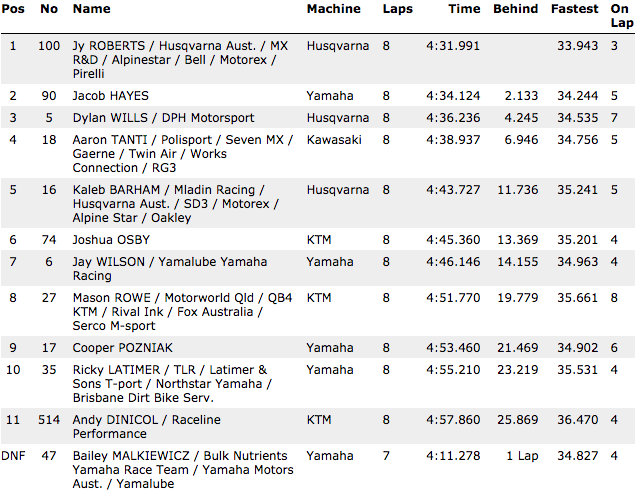 Hayden Mellross (DPH Motorsport Husqvarna) led from the early stages, although a crash on lap demoted him out of P1. Kyle Webster (Penrite CRF Honda Racing) inherited the lead and went onto win ahead of teammate Jackson Richardson (CRF Penrite Honda Racing, Cameron McAdoo (Penrite Honda Racing), Mellross and Wilson Todd (Serco Yamaha). The sold-out arena roared when Chad Reed (Autotrader Yoshimura Suzuki Factory Racing) snatched the hole-shot in SX1 heat one, although he was in hot pursuit by Justin Brayton (Penrite Honda Racing). The duo engaged in a battle for the duration, however Reed fended off the current SX1 points leader. Luke Clout (KTM Motocross Racing Team) was third ahead of CDR Yamaha Monster Energy Team duo Dylan Long and Lawson Bopping. Dean Wilson (DPH Motorsport Husqvarna) launched to the lead in SX1 heat two while being chased by Brett Metcalfe (Penrite Honda Racing) and Jason Anderson (Rockstar Energy Husqvarna Factory Racing) in the early stages. 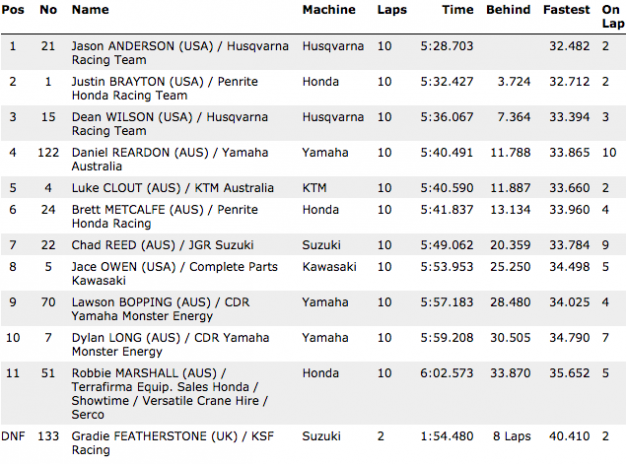 Anderson stole P1 with two laps to go, securing victory ahead of his former teammate Wilson, followed by Dan Reardon (Yamaha) and early leader Metcalfe. 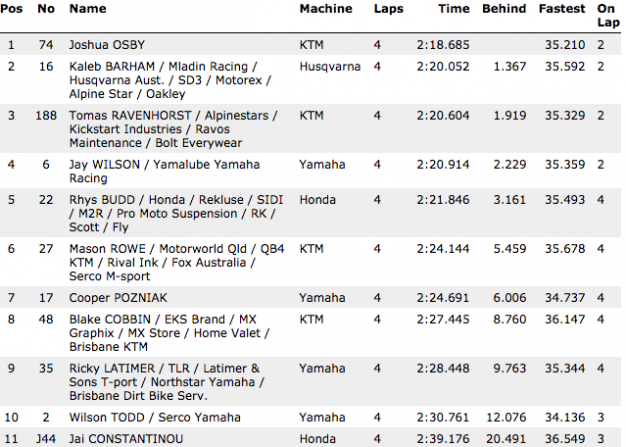 Raceline Pirelli KTM’s Josh Osby shot out the lead early on as title contender Wilson Todd (Yamalube Yamaha Racing) made two costly mistakes on the opening lap, ending his bid for the crown. 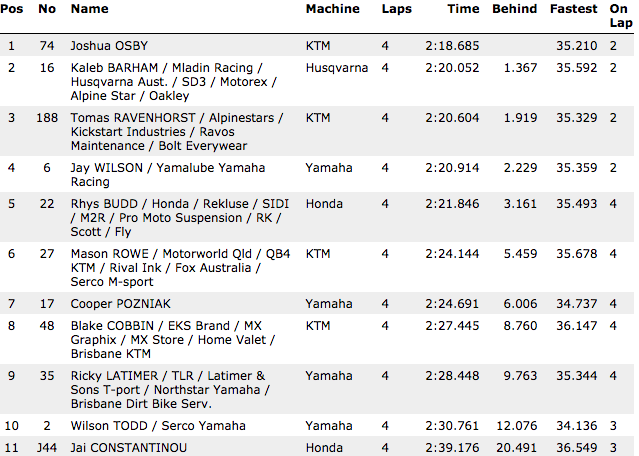 Barham held on for second over Tomas Ravenhorst (KTM) and Wilson, who maintained his championship hopes with the final transfer position. 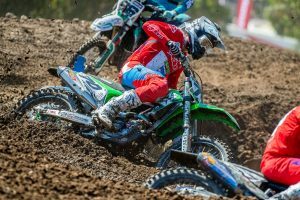 Complete Parts Kawasaki Racing Team’s Jace Owen wasted no time in his ensuring he made the main event, storming to victory after leading from start to finish. He was joined in transfer positions by Bopping, Gradie Featherstone (KSF Racing Suzuki Ecstar) and Robbie Marshall (Honda). Roberts kickstarted the Triple Crown by securing the early lead, as Wills and McAdoo soon followed. 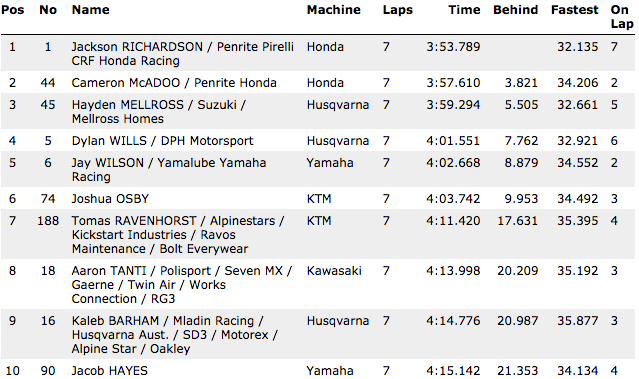 Wilson was caught up in an incident on lap two, but quickly recovered unscathed. The battle for second heated up between Wills and McAdoo as they traded positions on multiple occasions, however the American import eventually held the upper hand on Wills. 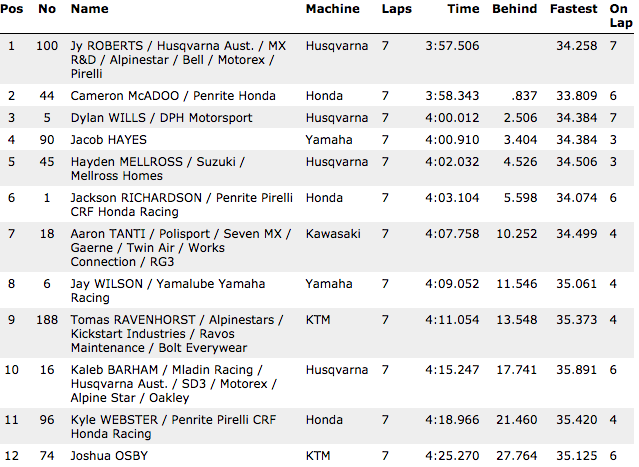 Roberts clinched the win over McAdoo, Wills, Hayes and Mellross. Wilson returned to P8. Richardson escaped the opening turn mayhem in main event two, which ultimately claimed race one winner Roberts along with Hayes and Webster. Mellross utilised the shortcut lane to place himself ahead of championship rival Wilson, the manoeuvre replicated by Wills on the following lap. In the end it was Richardson, McAdoo, Mellross, Wills and Wilson. 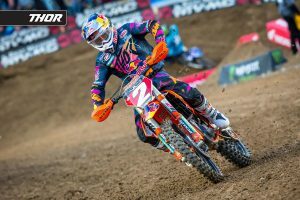 A seventh place finish was enough for Wilson to secure the 2018 SX2 crown, while it was former champion Richardson who once again positioned himself out front in the final encounter with Mellross and McAdoo in tow. Wilson used the shortcut lane in the opening stages along with Osby, as did McAdoo the following lap to secure the lead briefly. 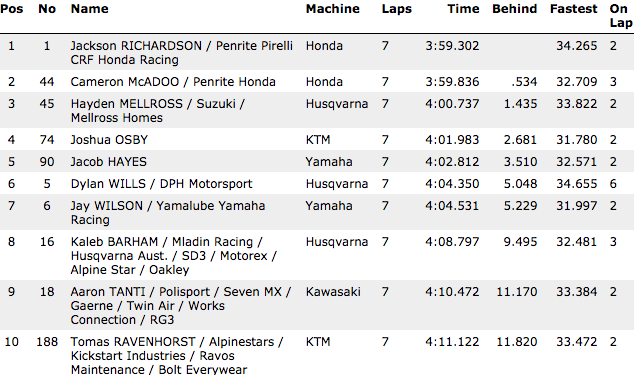 Richardson hung on for the win ahead of McAdoo, Mellross, Osby and Hayes. 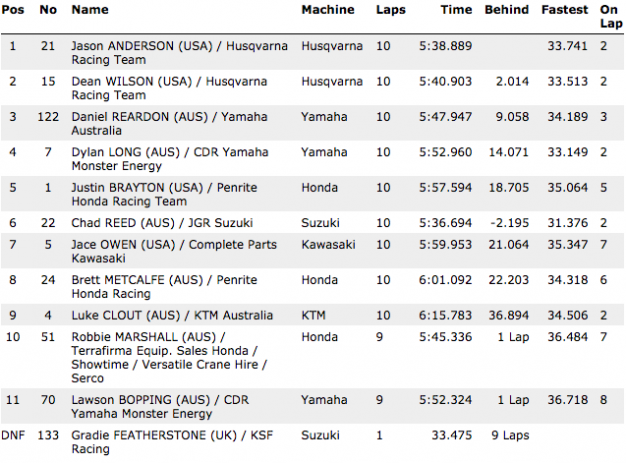 Overall on the podium it was McAdoo with the victory in his first Australian appearance, as second and third were credited to Richardson and Mellross. Brayton shot off to a thrilling start in SX1 main event one, as Featherstone fell victim to nasty crash down the opening straight. Reed spun out on lap two, much to the crowd’s disbelief. Meanwhile, Anderson laid down a hard pass on Brayton to gain P1. 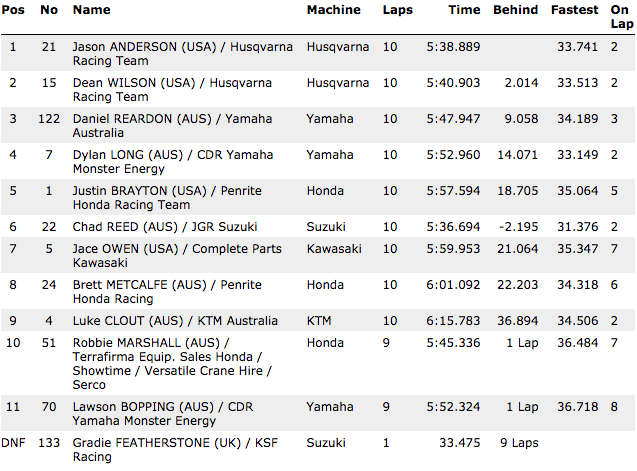 Bopping and Long made the same mistake as Reed a number of laps later on separate occasions, while Anderson went onto secure the win. Brayton wound up second followed by Wilson, Reardon and Clout, with Reed rebounding for seventh. 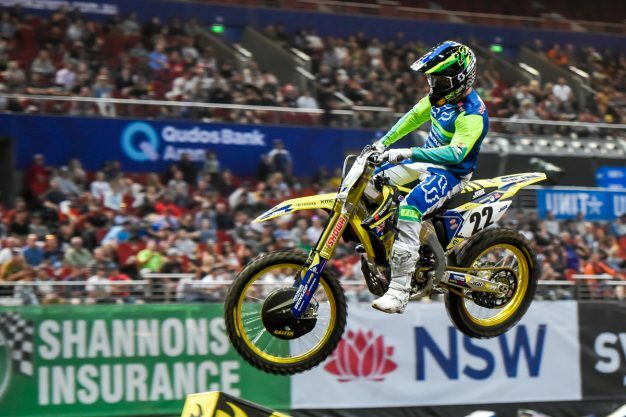 It was Reardon and Clout who led the field from the get-go in SX1 main event two, although Clout’s tenure in top two lasted less than a lap when he crashed ahead of the finish line. 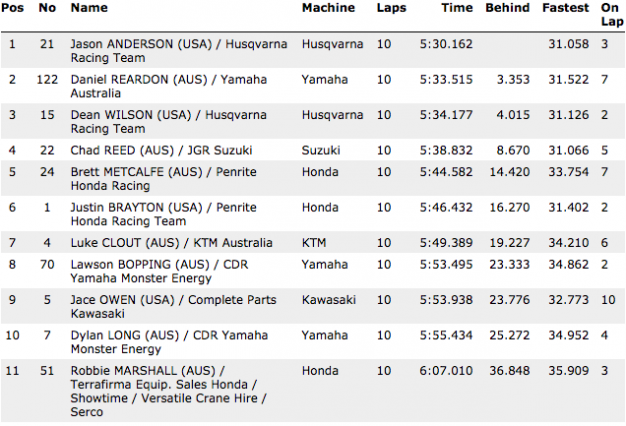 Wilson grasped his opportunity to take the shortcut lane, ultimately moving by Reardon and into the lead. 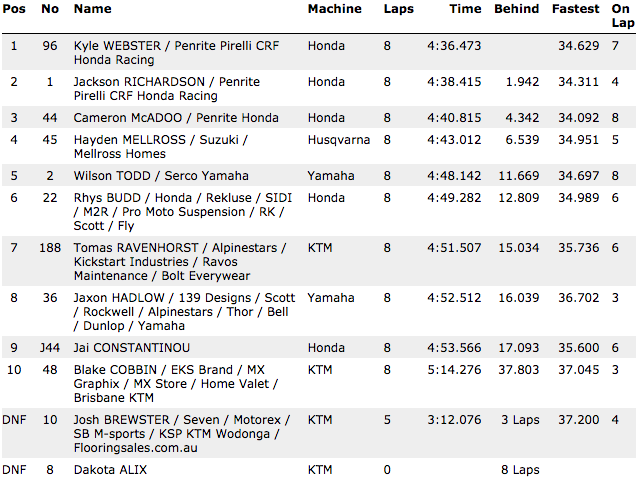 Anderson did the same one lap later to move into second, at the same time Brayton went down. A thrilling battle between Wilson and Anderson unfolded out front, but Reardon used the shortcut lane and made it a three-rider ordeal. 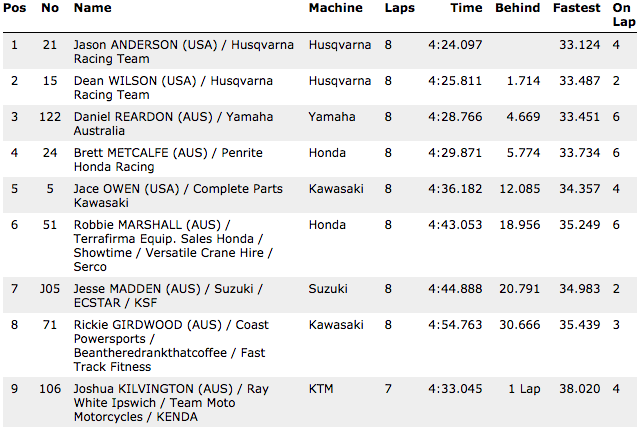 In the end it was Anderson from Reardon, Wilson, Reed and Metcalfe. Anderson took a narrow hole-shot in the final affair with Wilson and Reed capitalising on a mistake from Reardon. 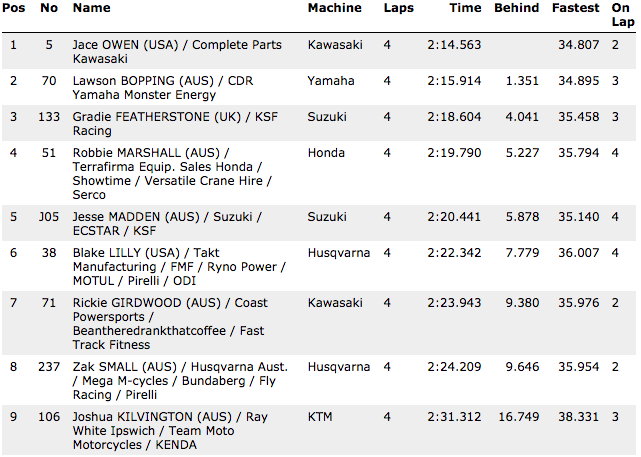 A number of riders crashed in seperate incidents, including Clout, Bopping, Metcalfe and Featherstone. Reed took the shortcut lane for a second time, which meant he would incur a five-position penalty despite crossing the line in P1, demoting him to sixth. 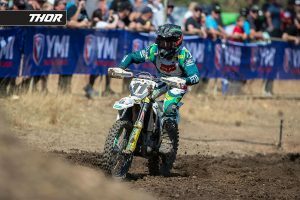 Anderson was credited the win with a top five completed by Wilson, Reardon, Long and Brayton, who secured his third-consecutive SX1 championship. Overall for the round it was Anderson untouched to repeat his result from one year ago, joined on the podium by Wilson and Reardon. In championship terms, Brayton’s fourth for the round was enough to be crowned, ahead of Metcalfe who was P6 tonight and Reardon. Reed ended up fifth overall in his anticipated homecoming aboard the factory RM-Z450.